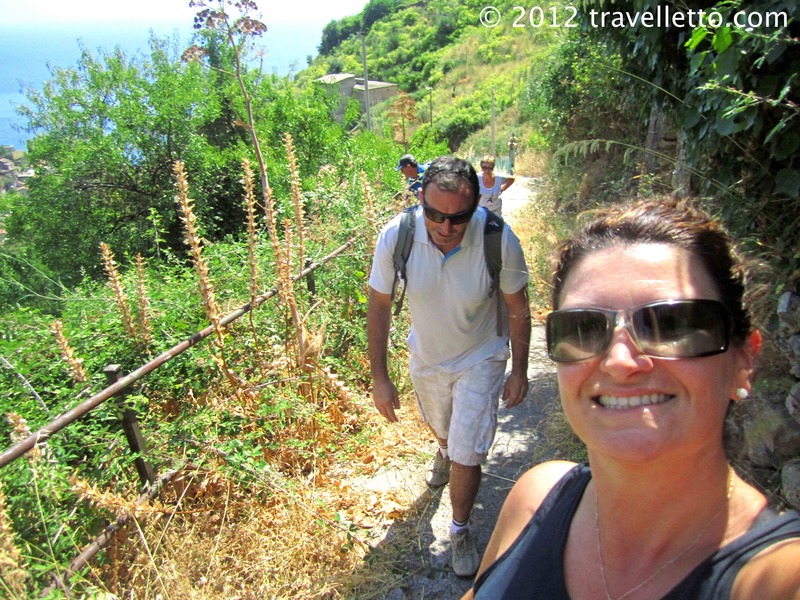 Castelmola is a hilltop town 5km from Taormina, uphill the whole way. Some crazy person suggested that it might be a good idea to walk there and have a look at the town (hint – Walter). 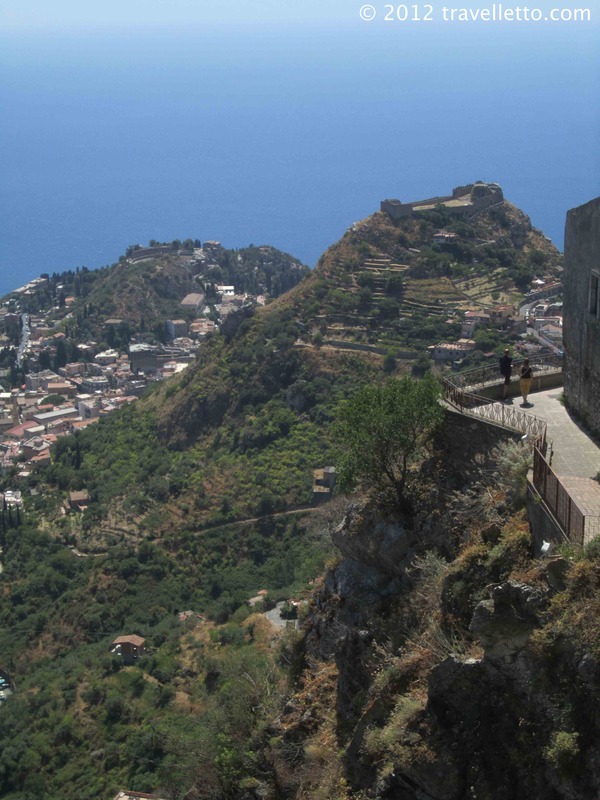 The plan was for Mum, Dad, Zorba and I to meet at 8.30am, walk 10 minutes from our villa to the funicular, catch the cable car up the hill to Taormina, have a decent coffee, walk to the Greek amphitheatre to check it out and then walk up to Castelmola. So we left at 9am…a little later than we would have liked, but that’s life when on holidays. 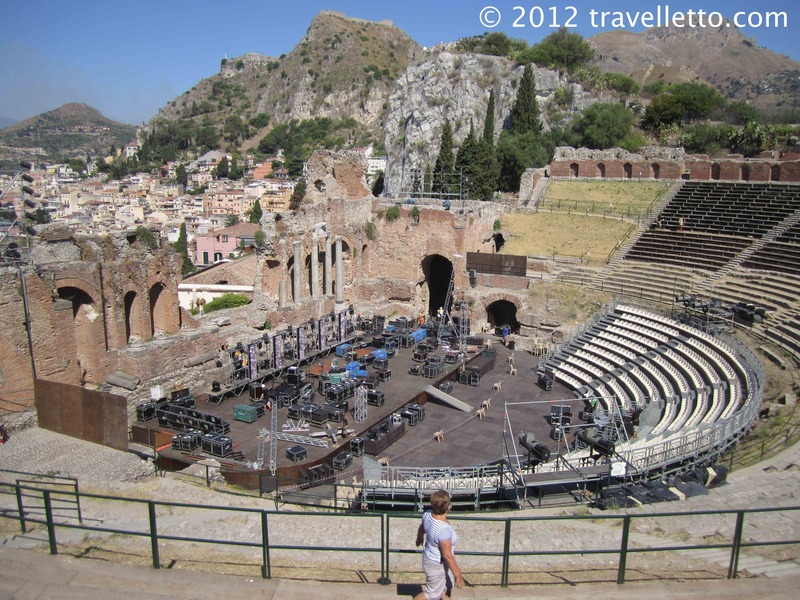 Taormina itself is ancient and dates back to 3 BC. The Greek amphitheatre is said to have been complete in 2 AD. It cost 8 euro each to enter and it was worth it, quite impressive. The awesome views from the amphitheatre are worthy of the entry fee on their own. There were heaps of roadies at the amphitheatre setting up staging and lights for a series of concerts that are going to be held over the next few days. 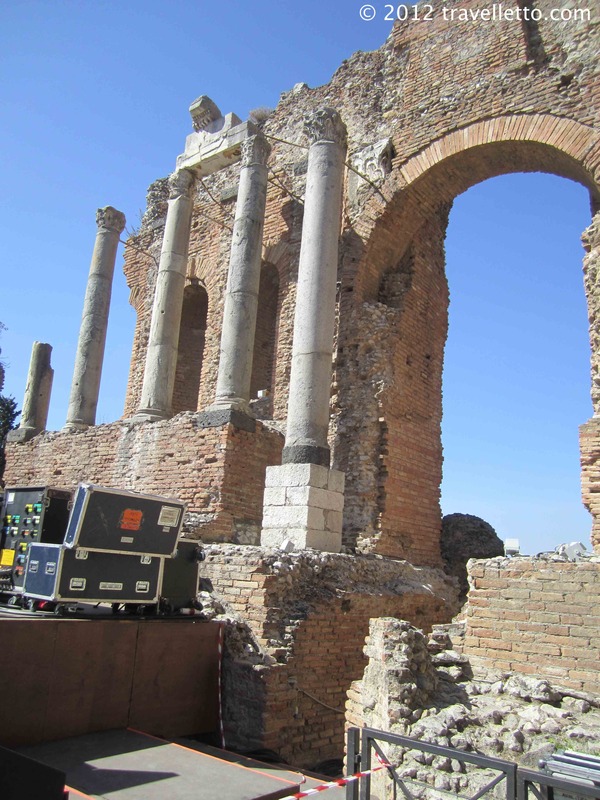 It would be a gorgeous setting for a concert – we were hoping to be able to see something there whilst in Taormina. As it turned out, the music concert on that night was sold out, and the only other show during our time there were two Italian comedians. My Italian language skills can impress some that don’t speak a word of another language, but they are no where near good enough to understand the jokes of a couple of fast slang talking comedians. Che peccata! What a shame! That sounded pretty good to me. Although, I learned later that the 20-minute walk was to the old ruined castle on top of another nearby hill that Walter was keen to check out, not Castelmola. Sigh. It’s safe to say that the five kilometre uphill (more like up-mountain) walk to Castelmola was difficult. A never-ending staircase took us about half way up, and the steep road interspersed with steps, took us up the other half. It was a blistering hot day – must have been close to 40 degrees – and whenever we found a spot of shade, we stopped to catch our breath. I was coping, but finding it difficult, Zorba was a Greek mountain goat (yet again – see Hiking in Cinque Terre) trotting up and then waiting for us to catch up and Mum and Dad were both feeling the heat. After a solid hour of uphill climbing and profuse sweating, we reached Castelmola. So happy to have reached the top! Yippeee! W all felt the great sense of achievement of conquering the mountain! And what a quaint cute little hilltop town it is. Simply gorgeous! 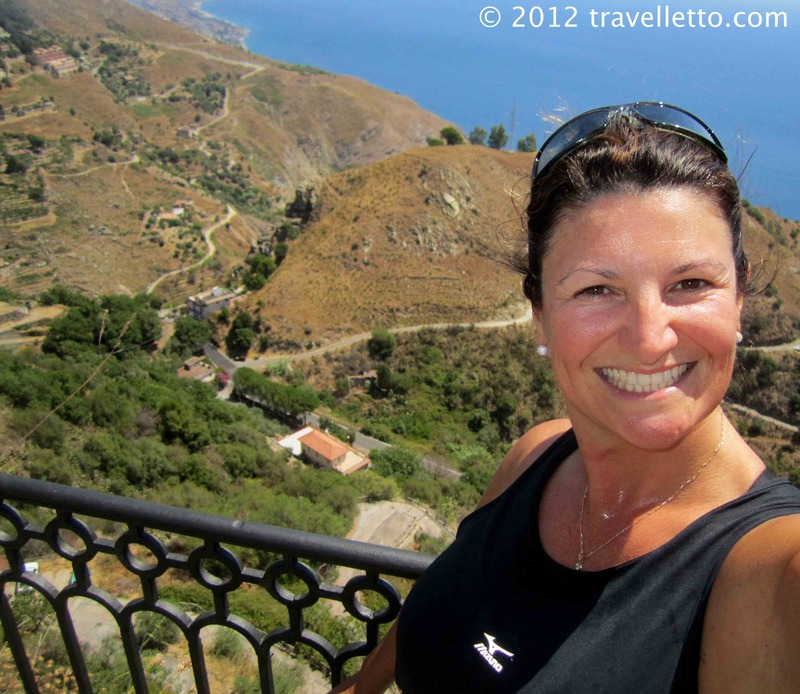 The views go forever and ever over hills, over other towns, Taormina, and of course the blue Mediterranean Sea. Che bella! Castelmola is a tourist friendly town with tourism officers at the entrance of the town waiting to greet visitors. Walter asked them about the bus that goes back down the hill to Taormina and he was told that it leaves 15 minutes past every hour. Great! We walked through the agreeable little town, had a taste of the speciality of the town, Vino alla Mandorla – an almond wine that I thought it was quite nice. It was like a marzipan liqueur. Walter didn’t like it, but Zorba and I did. We made a mental note to buy a bottle on our way out (which we conveniently forgot to do). Mum and I were looking at the few shops that were in the town when we lost Zorba and Dad. Hmm, I bet they have gone up to the top of the castle I say. The last thing we felt like was climbing more stairs, but Gina and I soldiered on. Once at the top, the view was lovely, just as lovely as from the town just below. The ruined wall that was once a castle isn’t worth mentioning (and I was too knackered to appreciate it), and Walter and Zorba were nowhere to be seen. Thank God there were a few trees up there providing some shade. It was really baking hot. Back down to town, and down the stairs we trudged, step after step. Back into Castelmola, we found the boys sitting in a bar at an outside table under a tree enjoying a large ice cold beer. Aaah, two more thanks! Beautiful cold beer, a well deserved too. 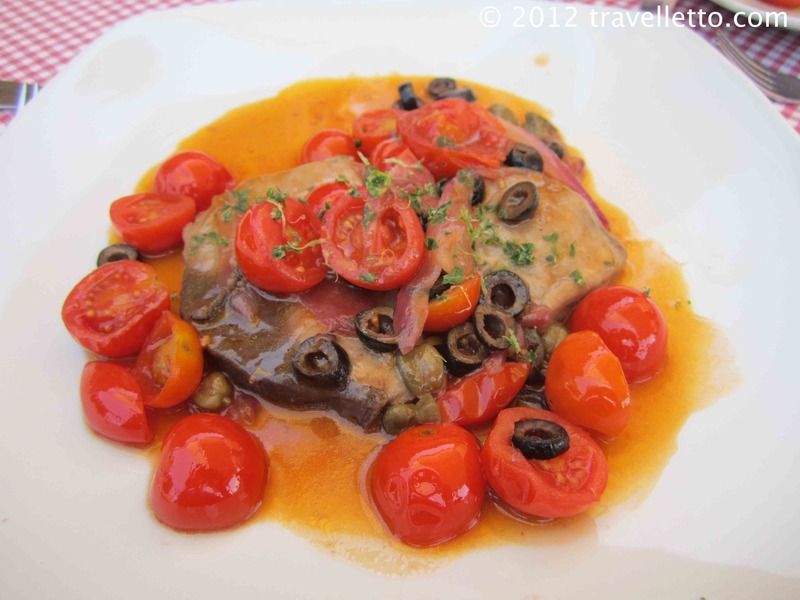 Tuna steak cooked in Sicilian sauce of tomatoes, capers, and olives. Delicious! For lunch we chose a restaurant called La Taverna dell’Etna for no particular reason except it looked good, was covered and protected from the baking sun, and had a nice view. It proved to be a good choice as lunch was scrumptious! Mum and I both had tuna steak cooked Sicilian style in a sauce with red onion, cherry tomatoes, olives and capers; simple yet delicious. I could eat that every day and not get sick of it. 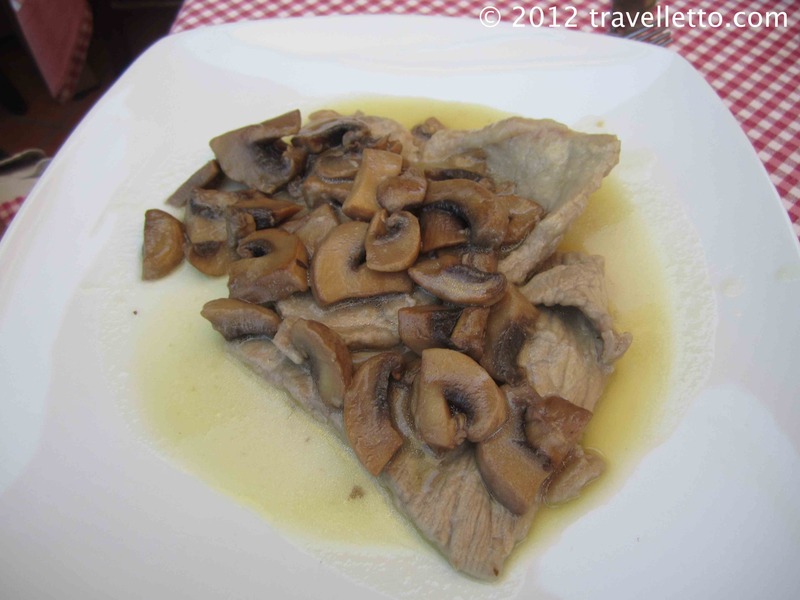 The boys had scallopine con funghi – veal with mushrooms. It too was very tasty, but I think Mum and I chose dish of the day. All side salads were fresh and crunchy. Absolutely delightful. 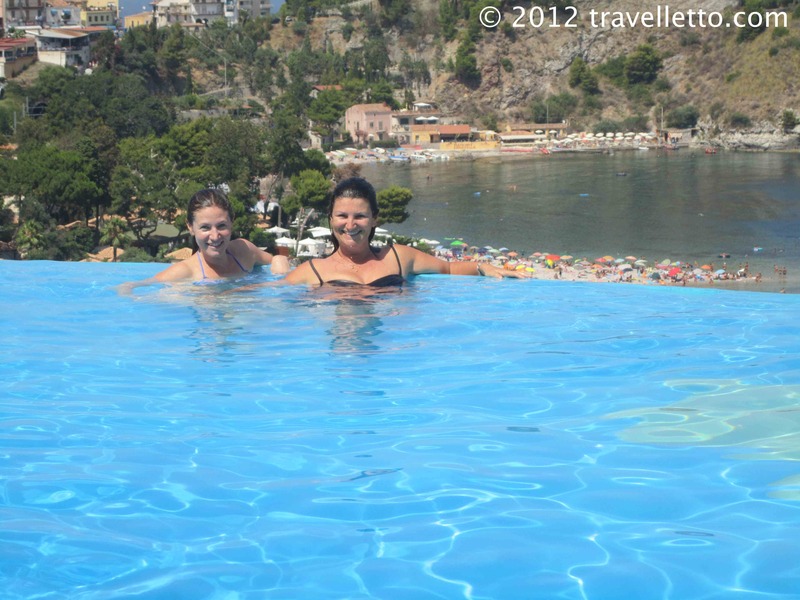 We rushed to leave because we wanted to catch the 2.15pm bus back to Taormina. We all agreed that the walk up was sufficient torture for the day and we wouldn’t be walking down. My knees were whimpering at the mere thought of the steep descent! Dad quickly paid the bill (thanks Dad!) and off we scurried, out of town, down the hill, down the stairs into the blazing sun to the bus stop. Uh-o. Un problemo. The bus timetable at the bus stop stated that there was a bus at 13.15 and the next one at 15.15. Bugger!!! Even the buses have siestas! Poo poo poo! Zorba and I contemplated walking back down for about 20 seconds. In the end, the decision to walk back up the hill into town, find a place to have a beer and wait for the next bus at 15.15 was a far more appealing option. When we reached the entrance to the town of Castelmola, there was a lovely shiny taxi just waiting there, seemingly for us. For 15 euro, he drove us 20 minutes down the steep windy road back to Taormina, however dropping us off at the other end of town, the far end. Sigh. Have I mentioned the stinking hot blazing sun already? I felt my skin frying as we walked through town – thank the Lord for air-conditioned gelaterias. Everyone enjoyed a gelati, except me, I had a coffee granita instead. The icy cold coffee was the perfect pick me up. Oh hurry up and get me home! What a mission to get home: A walk through Taormina looking at closed shop after closed shop, a walk down the hill to the funicular, a wait at the funicular, and then the never ending walk back to Villa Il Suk, our home for the week. I collapsed on the bed for about 10 minutes, tired, hot, and a bit cranky then mustered up the energy to get changed into swimmers and jump into the Hollywood pool. Aaaah, that’s what I needed! !